2019 marks the first year for the Spirit Bear Award. 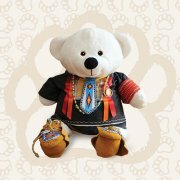 Named in honour of Spirit Bear, who is a symbol of reconciliation and equality for kids, this award will go to a group of young people who demonstrate their collective commitment to reconciliation and the Truth and Reconciliation Commission’s Calls to Action. A child and youth panel will select the recipient of the award. The group of young people selected will receive $500 to use as they would like toward their activities or simply to celebrate! Do you know a group who has been doing work on reconciliation and the TRC Calls to Action? Other materials that might support the nomination (links to video clips, pictures, etc).